This year's tutors: Francisco Freixo, Helena González, Benjamí Oller, Bahareh Eftekharzdeh, Anabel-Lise Le Roux, Michela Candotti, Jordina Guillen, Ana Ferreira, Julia García, Sabine Klischies, Natàlia Trempolec, Juliana Amodio and Montse Fàbrega. 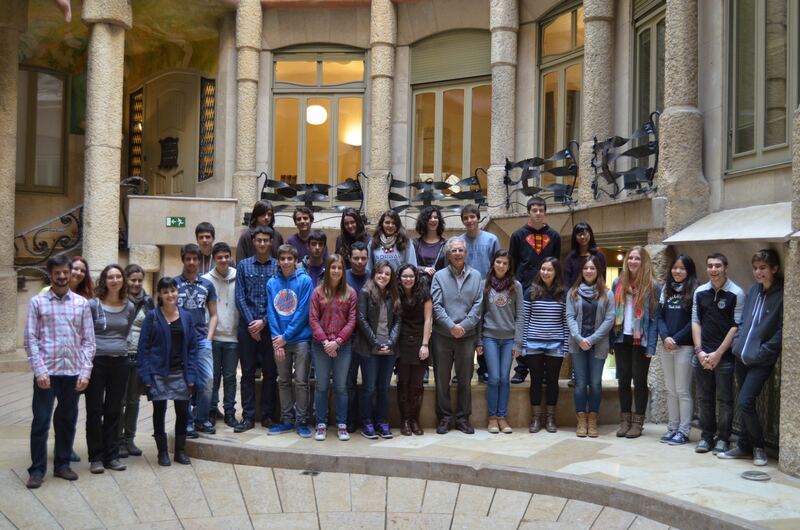 Participants of the “Crazy About Biomedicine” 2013 course. This course includes a mixture of theoretical lecture sessions and practical hand-on experimental activities, to take place on 18 Saturdays throughout the calendar year. The course will cover 12 current scientific topics, ranging from cell and molecular biology, to structural and computational biology and chemistry, presented by IRB Barcelona PhD students. In the first ‘semester’ (Jan-June 2013), the first 3 Saturdays will be dedicated to these general lectures for all participants. During the following 6 Saturdays, small groups will enter the labs for the hands-on practical sessions. This schedule will then be repeated with 6 new research topics for the second semester (June-Dec). Participating students must commit to attending for the duration of the year. The course will run from January to December 2013, 10.00-14.00h. Interested students must fill in the online application form and include a letter of motivation. A letter of recommendation will be requested directly from two of their teachers. The deadline for registration is October 31, 2012. The cells of all living beings have a “skeleton” that provides support for all their functions, such as the transport of proteins throughout the cell, organization of the cell shape, and even cell motility, migration, and division. In human cells and other eukaryotic cells, this “cytoskeleton” is made up of a number of structures, including “microtubules”, which are tiny cylinders that can shrink, elongate, bundle, and distribute throughout the cytoplasm, according to the cell’s needs. Other important structures in the cytoskeleton include “centrosomes” and “mitotic spindles”, which play an important role in cell division, helping to ensure that the genetic material of a dividing cell will be equally split into each of the two new cells. Centrosomes and mitotic spindles are often found to be abnormal in cancer cells, and therefore these structures are of great interest in cancer research. In this two-part course, which will run over both semesters, we will learn about the components of the cytoskeleton, and take a look at why they are so important for the cell. In the practical exercises, we will show you how microtubules organize inside a cell (in arrays of various types and shapes), and how the cells depend on these arrays. We will analyze the molecules that regulate where and when different cell types form their microtubules, using tissue culture cells and mouse hippocampal neurons, and fluorescent light microscopy techniques. 2. What does DNA damage have to do with cancer? DNA is a long molecule that contains “genetic information”, a coded instruction manual for the cells. Everything the cells do is somehow coded in DNA. It determines, for example, which cells should grow and when, which cells should die and when, which cells should make hair and what color it should be. Simply put, DNA tells cells how they should behave correctly. But sometimes the DNA becomes “mutant”, which means it has been damaged or broken. As a result, these instructions can be misread, leading to the development of diseases such as cancer. Fortunately cells have a very effective system to repair these lesions: the DNA Damage Response pathway. Its job is particularly difficult considering that DNA is constantly attacked by toxic agents (like sun radiation, pollution, tobacco). Its function is extremely important because a failure to repair DNA lesions may result in cancer. This course will give important clues to understand the link between the factors that cause DNA damage and the development of cancer. We will also have the opportunity see what happens inside the nucleus of a cell after it has been damaged. Can it be repaired? Peptides are small proteins, which are biomolecules made out of amino acids. One of their main roles is to interact with other molecules, generally bigger proteins, in order to initiate or prevent their function. Some peptides in particular are recognised by protein receptors on cell membranes and are internalized. This natural function can be used in some cases to transport bioactive compounds that are unable to cross certain barriers. One of the most impenetrable biological barriers is the one that separates the blood from the brain, the blood-brain barrier (BBB). This structure is the main hurdle for drugs meant to treat illnesses affecting the central nervous system, such as Alzheimer’s and Parkinson’s diseases or brain cancers. Some potentially effective treatments for brain diseases are based on proteins, but most of them cannot cross the BBB so they have a very local effect that is often not enough to overcome the illness. Linking peptides that are able to cross the BBB to these proteins can greatly improve their distribution and thus their efficacy. However, decorating protein drugs with peptides without affecting their activity is not an easy task. Proteins have many reactive groups on their surface and only some of them should be modified. Organic chemistry offers many different strategies to meet this challenge, which will be explored in this seminar. We will learn about reactions that allow us to modify the side chains of certain amino acid residues, the sugars that are often linked to them or the N-terminus of the molecule. Ultimately, in the practical session, we will perform a selective ligation and we will analyse the outcome of the reaction. Alzheimer’s disease is the most common form of dementia. It has no cure, and symptoms worsen as the disease progresses, eventually leading to death. It was first described by German psychiatrist and neuropathologist, Alois Alzheimer in 1906. The causes and progression of Alzheimer's disease are not well understood. Research indicates that the disease is associated with plaques and tangles in the brain. Current treatments only help with the symptoms of the disease, but none stops or reverses its progression. As of 2012, more than 1000 clinical trials have been conducted to find ways to treat Alzheimer’s, but it is unknown whether any of the treatments being tested will work. Mental stimulation, exercise, and a balanced diet have been suggested as ways to delay cognitive symptoms (though not brain pathology) in healthy older individuals, but there is no conclusive evidence supporting an effect. This course will take an in-depth look at the mechanisms of neurodegeneration, with a focus on two main ones in Alzheimer’s and Parkinson’s disease. We will begin with an introduction to the history of these diseases, looking at the first times they were detected in brains of patients. This will be followed by an in-depth explanation of the molecular and cellular mechanisms of disease. Next we will go through the hypotheses for the causes, and the latest research approaches to finding cures, including the latest medical strategies. Finally we will finish the course with a question and answer session where students will have the opportunity to think about the possibilities and approaches in this field of research for the future. Cells and organelles are surrounded by membranes, which separate, organize and act as scaffolds for many processes. Membranes are formed by a “lipid bilayer” – a two-layered structure composed of insoluble lipid (or fat) molecules that acts as barrier to keep other molecules in the cell where they are needed and prevent them from traveling into areas where they are not. Lipids can also form other sub-cellular structures, such as “vesicles”, small bubbles that transport their contents throughout the cell. A special type of vesicle called a “liposome” can be formed artificially and used as a vehicle to administer nutrients or drugs, therefore highlighting the important role that lipid membranes can play in the treatment of disease. This course will begin with an introduction to the basic properties of biological membranes: Why are they insoluble in water? Why can detergents dissolve lipids in water? What is the role of vesicles? Why is membrane fusion useful? We will also take a closer look at the contribution of membranes to cell function. How can molecules cross the lipid bilayer? What prevents cells from exploding? The practical work will consist in producing some artificial lipid multilayers, in the shape of vesicles. In this small project we will learn how the knowledge of protein structure can be combined with computational tools such as molecular docking to discover a new drug. We will study the case of HIV-1 protease, starting from basics about protein structure, the features of its binding pocket and later understanding how protein-ligand interactions can be evaluated. Each student will visualise and analyse the features of our target protein structure and evaluate a compound using docking software. At the end of these steps we will be able to discriminate which compounds can be effective drugs. This course will give a general overview of how to use the African clawed frog, Xenopus laevis, as an animal model system. In our laboratory we use Xenopus laevis oocytes to study the meiotic cell cycle and the translational control of maternal messenger RNAs (mRNAs). Meiosis is a type of cell division that reduces the number of chromosomes in the parent cell by half and produces gamete cells. During meiosis there is no transcription and the key protein activities that drive this process are mainly controlled at the level of translation of previously stored maternal mRNAs. A family of proteins called CPEB (cytoplasmic polyadenylation element binding protein) are responsible for the translational control of maternal mRNAs by a process called “cytoplasmic polyadenylation”. Although we will focus on the meiotic cell cycle and the first embryonic divisions, gene expression regulation at the level of translation of mRNAs controls other biological processes such as cell proliferation, differentiation, senescence, synaptic plasticity and angiogenesis, as well as pathological processes such as tumor progression. In the practical course we will do three different experiments with Xenopus laevis oocytes: 1) in vitro fertilization of frog eggs and observation of the first embryonic divisions. 2) Selection and micro-injection of oocytes. 3) Observation of oocyte chromosomes aligned in the second metaphase plate, under normal conditions and in the absence of an essential protein for meiosis (CPEB4). As an animal develops, its body parts and organs must grow to achieve the proper size and shape that is characteristic of each species. This growth has to be coordinated between and within the different organs in order to generate fully functional adults. How organs achieve a particular size and pattern is one of the fundamental questions in developmental biology today. Our laboratory studies the cellular and molecular mechanisms underlying the regulation of tissue growth during normal development. For this purpose, we use the fruit fly Drosophila melanogaster, a well-described animal model often used in developmental biology. The fruit fly has many advantages as a model system, including the fact that it is well suited for genetic and molecular studies. Specifically, we focus on the wing “imaginal disc”, which grows and proliferates during the larval stages of the fly to give rise to the adult wing. The size and shape of the final adult wing is determined by the rates of cell division, cell growth and cell death during wing disc development. To reach a proper size and shape tissue and cell growth must be carefully controlled at the molecular and genetic levels. Otherwise this can lead to uncontrolled growth and proliferation, characteristic of cancer cells. During this course, we will take a look at imaginal disc development and see first-hand how effective Drosophila can be as a model system. We will use classic genetics and confocal microscopy techniques to observe how size can be affected at the level of the organ and organism. This course is a continuation of “Peptide shuttles” offered by Benjamí Oller in Semester I. This course is a continuation of the first session held in Semester I, led by Francisco Freixo. The application process for Crazy About Biomedicine has now closed. We have now completed selection of students. The following 24 students have been selected to take part of the course.